It's been a few months since I last swam at the Great Salt Lake. I was talking to Lisa about it and we decided to go out today to check on the conditions. Also, it has been reported that a sunken boat was discovered near the marina and we wanted to check it out. Goody called me yesterday and I invited him to come swim with us. 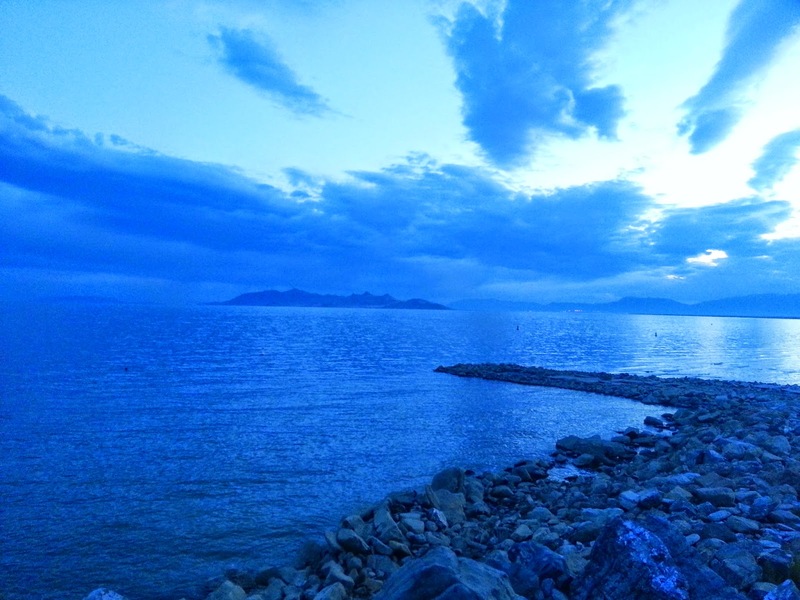 The Great Salt Lake is awesome! It get's a bad rap with the locals, but it really is a great place to swim and explore. I typically stay away during the summer months because that is when the flies and spiders are really heavy and the water temperature is too high. During the Spring and Fall, it is beautiful. The gate is supposed to open at sunrise, which would have been about 6:45am this morning. We got there around 6:30, expecting the gate to be closed. To our surprise, it was open! When we got to the parking lot, there was a photographer there who already had his equipment set up to capture the sunrise. The gate must have been open around 6am or so. Had we known that, we would have started much earlier. After getting greased up, we headed down to the ramp. The water inside the marina is still a bit sketchy. There are a lot of flies on the water. Once you get outside the marina, however, the water is perfect! In the future, we'll start from Silver Sands beach so that we don't have to swim through the bugs. I've forgotten how different it is to swim in the GSL. You feel so FAST out there. It's a great feeling. As we got outside of the marina, we caught just the beginning of the sun rising over the mountains. It was incredible. Pink mixed with the white of the clouds and the blue sky, reflected off of the surface of the smooth as glass water. We decided to do a Gridley Straight (marina to Black Rock, 1 mile distance) so that we wouldn't ruin the photo that the photographer was so patiently waiting for. The water was super calm, and I just cruised down to Black Rock. We floated and chatted for a bit. I really think you could take a nap just floating on the water. It's the ultimate water bed. We took some photos and headed back to the marina. Goody doing some butterfly near Black Rock. I was feeling good and decided to try to push it a bit on the way back. I started my timer and took off. I touched the buoy at 21:47. Not bad. With the workout over, it was time for some fun. I have been seeing reports of a sunken boat that was just discovered outside of the marina. The boat was reportedly built for Brigham Young to take cattle to Antelope Island. The wreck is marked with a buoy, so we swam over to check it out. It's unbelievable that no one has found this boat until now. When we got there, it was shallow enough that we could actually stank on the wreck. It is maybe 100 feet from the break wall. We played around for a while, diving down to try to get a better look. I tired getting some photos, but they didn't turn out. Diving down to get a better look at the sunken boat. Goody and Lisa hanging out near the shipwreck. I swear there is a sunken boat in this picture somewhere. It was an awesome swim this morning and I was happy to be back at the Great Salt Lake.